It’s 10:00 a.m. on Saturday, and you’re rolling out of bed to start your day. Just as you are starting your morning coffee, there’s a knock at the door. Who could that be on a Saturday morning? You open it to find a nice person on the other side with a clipboard and campaign flyers ready to peddle a new candidate for local office. Sound familiar? In the wake of so much political turmoil, it’s more critical than ever to have both knowledgeable and active community members out in the field. But the act of canvassing can be an intimidating one. In this article, we will guide you through the ins and outs of canvassing -- what it is and why we do it. Let’s dive in! The formal definition of canvassing, according to Merriam Webster, is “to solicit votes, subscriptions, opinions, or the like.” More specifically, canvassing is a term used most often in politics to refer to the act of going door-to-door and soliciting support for a cause or candidate. Door-to-door canvassing has been the foundational form of political communication and engagement for centuries, and myriad research shows that face-to-face communication is still the most effective form of persuasion for political organizing, fundraising, and more! It’s no wonder, then, why canvassing has survived as the bedrock of modern electoral politics -- but what’s the point? When people think of door-to-door canvassing, they tend to get an image of Election Day chaos and political candidates making stump speeches. While this is certainly true, there are many other reasons that people use canvassing as a tactic. Let’s take a look at some of the reasons why someone might want to take to the streets. Let’s start with the most obvious reason: asking for support for a political candidate. Any candidate for office, particularly if they’re running for a local office, will be intimately familiar with canvassing. In fact, they will be on the road during the year leading up to the election going door-to-door to learn the issues of the electorate and propose solutions to address them. But these sprawling political campaigns would all be for not without the support of volunteers. They spend their weekends talking to their neighbors about Candidate Z’s proposals on education, the environment, and more. As a volunteer, your primary goal is to identify whether the voter will be supporting your candidate. If they will, fantastic! You might have just found yourself a new volunteer. If not? Well, now we know. But the likely situation is that they are just unsure. When this is the case, you will likely have a script of talking points meant to engage the voter, finding reasons why they’re unsure and opening a dialog to influence them in favor of your candidate. 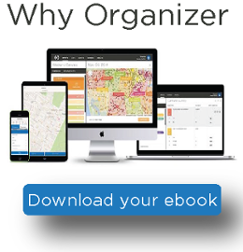 At the end of the day, you’ll bring all that information back to your field organizer, and he or she will use that data to inform the campaign’s next move. Issue-based advocacy is increasingly one of the most common reasons why you may be hitting the streets with a canvassing effort. Anyone can pursue this route of advocacy. 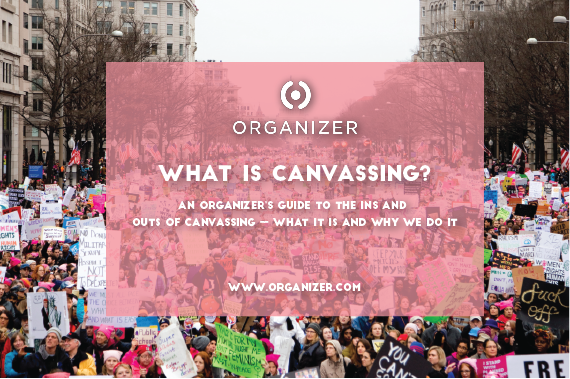 Whether you are volunteering to speak to your neighbors about a proposed construction project, or fighting for LGBT+ equality on behalf of a national nonprofit, canvassing remains the most essential tool for activists and organizers. In fact, in 2016 LGBT+ activists used a technique called deep canvassing, or in-depth conversations -- generally 10 minutes in length -- about political views led in an open and judgement-free way to fight the deeply ingrained prejudices that prevented progress in the marriage equality movement. 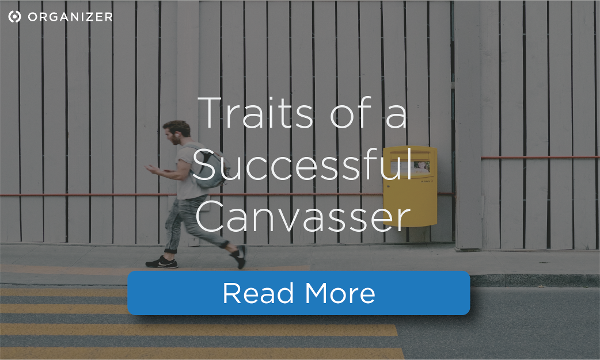 Deep canvassing proved to be effective at changing attitudes, and it has laid the groundwork for numerous studies on fighting prejudice through face-to-face interaction. Community awareness campaigns are great ways to draw visibility to your nonprofit or community organization, while also educating future members or activists on the issues facing your community. If you’re a campaign junkie, awareness campaigns provide an opportunity to build community over the long-term and keep your volunteers engaged in off-cycle years. Since 2012, Black Lives Matter has organized national community awareness campaigns, where local clubs come together to canvass neighborhoods and talk to community members about the issues on the top of their agenda, primarily addressing the oppression of black lives in our society. These campaigns are happening in every major city across the country, increasing visibility, education, and community power. They provide a unique opportunity to engage and educate parts of our communities that have been historically marginalized in the political process, providing an avenue for empowerment and re-engagement. If you’re interested in grassroots fundraising, this is as grassroots as it gets. According to the Center for Popular Democracy, “individuals” donated over $258 billion in 2014, making up 72% of total giving for the year. What’s more, giving from individuals is actually growing at a rate of 4.1 percent -- consistently on the rise over the 5 previous years! Grassroots door-to-door fundraising initiatives are increasingly popular with organizations at all levels, from campaigns to nonprofits. Small-dollar programs are also becoming increasingly popular with state parties and candidates. For example, Senator Bernie Sanders broke small-dollar fundraising records in the 2016 presidential primary with over 60% of the $220 million raised coming from small-dollar, individual donors. As a community or local organization, there’s no better way to increase your membership than grabbing a clipboard (or your smartphone) and hitting the streets! Charter schools have been using this method for years to recruit new students. They have recruited so many former public school students that even public school teachers and parents have begun going door-to-door to increase their own enrollment, forced in large part by these charter school canvassing operations. But public and charter schools are certainly not the only organizations to take advantage of this tactic. Local neighborhood associations, student governments, college clubs, community recreation and sports groups, and Democratic clubs across the country are leveraging door-to-door canvassing to drive their membership recruitment efforts!